Audacity is a free, easy-to-use and multilingual audio editor and recorder for Windows, Mac OS X, GNU/Linux and other operating systems. You can record sounds, play sounds, import and export WAV, AIFF, AAC, MP4, Ogg Vorbis, and MP3 files, and more. Use it to edit your sounds using Cut, Copy and Paste (with unlimited Undo), mix tracks together, apply effects to your recordings, change the speed or pitch of a recording, and really much more. Audacity enables FLAC support. 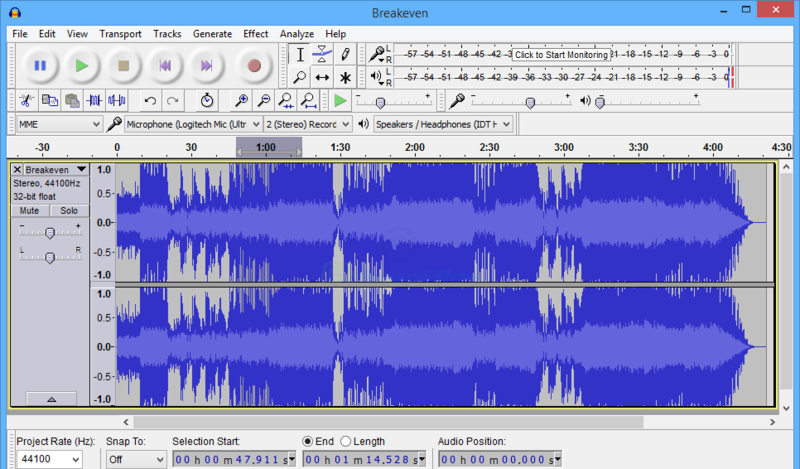 The program also has a built-in amplitude-envelope editor, a customizable spectrogram mode, and a frequency-analysis window for audio-analysis applications. The program has the built-in effects, including Bass Boost, Wahwah, and Noise Removal, and it also supports VST plug-in effects. Intel Macs running OS X 10.7 and later and macOS 10.12 Sierra, 10.13 High Sierra and 10.14 Mojave. GoldWave seems better in most ways.